I’m a man who loves his alternate history. Rome doesn’t fall, the South wins the Civil War, the Mongols ravage Europe, the Vikings survive in the New World—count me in. So imagine, savage readers, that the zombie craze began in the 1920s instead of the 2000s (due, perhaps, to the pioneering work of Dr. Herbert West during the Great War). Howard Carter worries about King Tut being a bit feistier than an 18th Dynasty mummy should be, Al Jolson performs in deadface, and Buster Keaton releases a delightful slapstick zom-com—think Shaun of the Dead, but black, white, and silent. That movie, I suspect, would be pretty close to Mike Polizzi’s Dead Drunk. 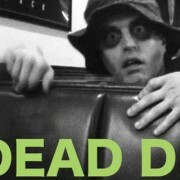 Starring Mike Lane in the title role, Dead Drunk is a web-based series of short films chronicling the misadventures of a man who has the bad luck to be bitten by a zombie while wasted. Rather than a mindless hunger for flesh, he’s suddenly afflicted with a mindless thirst for alcohol—and especially Mort’s Light Ale (evidently the “fresh brains” of beer). To the exasperation of his girlfriend Lily (played by Adrienne Asterita) and the terror of local bums and brewers alike, the Drunk shambles through a silent, black-and-white world to a catchy original score (Winner of the Macabre Faire Film Fest’s award for Best Soundtrack). I spoke with Mike Lane and Mike Polizzi recently to find out what goes into Dead Drunk’s undeniably unique brew. 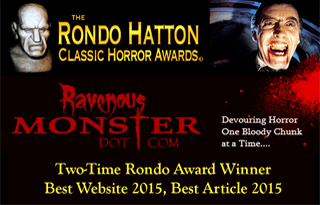 Ravenous Monster: Where did you get the initial idea for Dead Drunk? Mike Polizzi: The idea came to me after experiencing a beer-binge in Raleigh, NC. I flew down to visit my friend, Steve. Once I landed, his wife drove us around to several breweries, where we tasted just about everything on tap. Later: we arrived at a friend’s Christmas Party and were feeling ridiculously buzzed. I partook in more “beverages” and recall sipping on moonshine at one point. Before I knew it, I became a very animated person and lost control of my body. I tripped up a flight of stairs, landed flat on my stomach and remained there for a while. Steve eventually found me and asked what I was doing. “I’m just resting,” I told him, and then he helped me to my feet and the party continued. Months later: I reminisced about that evening, and then re-imagined it. I thought: what if this guy–me–encounters a zombie on the way to this party, transforms in the midst of it, and everybody mistakes his condition for drunken behavior. That became the kick-off to my Dead Drunk idea. RavMon: I love the fact that you’re making the series as a black-and-white silent film. What made you choose to go that route? MP: It evolved into a silent black-and-white film during preproduction. The original plan was to do it in color, with dialogue. But, I didn’t have a budget and, after being on hiatus for so long, I felt it was necessary to put something new out there. I didn’t have access to an HD camera yet, so I decided to use my iPhone. I didn’t have external audio equipment yet, so I decided to remove the dialogue. All of these limitations inspired me to harken back to the Charlie Chaplin and Buster Keaton era, which I was very excited about. It also gave me a chance to demonstrate my musical side. RavMon: The music in Dead Drunk is one of the most distinctive parts of the series. Describe your compositional process and inspirations for us. MP: As a born movie buff, I grew up collecting and listening to film scores. The composers that have influenced me the most over the years have been Danny Elfman, Bernard Herrmann and Jerry Goldsmith. When making a series like Dead Drunk, it calls for that dark and amusing sound, which those particular composers mastered. With that inspiration, I composed Dead Drunk, and was honored to take home the award for Best Soundtrack at the 3rd Macabre Faire Film Festival, this past June on Long Island, New York. 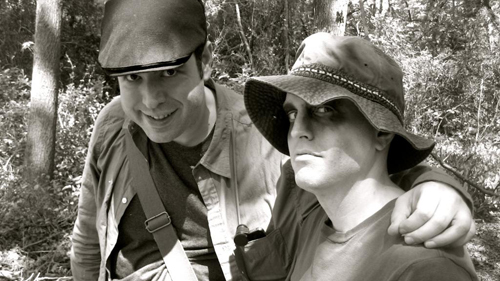 Dead Drunk creator Mike Polizzi and star Mike Lane. RavMon: Who are your biggest influences when it comes to directing? MP: I’ve always been a fan of Tim Burton’s early work; everything from Pee Wee’s Big Adventure to Sleepy Hollow. Sam Raimi is another one, after seeing Darkman and the Evil Dead films. I’m also very fond of Terry Gilliam’s films, Time Bandits and Fear and Loathing in Las Vegas. Raimi, Gilliam and Burton have a very unique style that I’m attracted to. I find them very inventive and artistic. RavMon: The series stars a bald guy in a bucket cap who can’t abide being sober; as a Hunter S. Thompson fan I have to ask: is the Dead Drunk a zombie stand-in for the good doctor? MP: No coincidence. The bucket hat on the main character is my tribute to the late Hunter S. Thompson. I still consider him to be my favorite writer, next to Clive Barker and Stephen King. RavMon: You were on sabbatical from acting before you took the lead role in Dead Drunk. What attracted you to the role of an alcoholic zombie? Mike Lane: Mike Polizzi was kind enough to offer me the role without having to audition. When that happens, it gives me even more enthusiasm to work. That being said, the role of Dead Drunk is fun and wacky and while I love all kinds of acting, I usually find myself more attracted to those kinds of roles. RavMon: What are the challenges of playing a silent versus speaking part? ML: I actually think doing silent movies are easier since there are no lines to memorize. Memorizing lines is time consuming and there is a bit of pressure to get the lines right. But a challenge in doing silent movies is getting the timing right with my body as opposed to any lines. RavMon: Which actors inspire you most and why? ML: Lately it’s been Bryan Cranston, Aaron Paul and Peter Dinklage. All the acting in Breaking Bad and Game of Thrones have been incredible but those three actors really stand out. I always have a special place in my heart for Meryl Streep since her performances are flawless. An honorable mention must go to Andrew Lincoln for his emotional scenes in The Walking Dead. Great acting inspires me to improve. RavMon: You play a very expressive zombie. Did you go back and watch a lot of the great silent actors before the shooting began? Were you channeling anyone in particular? ML: I didn’t watch any silent movies to prepare but that’s a good idea! For Dead Drunk, I always thought of the zombie from the original Dawn of the Dead who went after guns instead of people. He would hold the gun up to his head and stumble around. There’s a little tribute to that particular zombie every time Dead Drunk has a beer bottle. And I usually think of Jim Carrey in the Ace Ventura movies for any kind of physical comedy roles that I do. 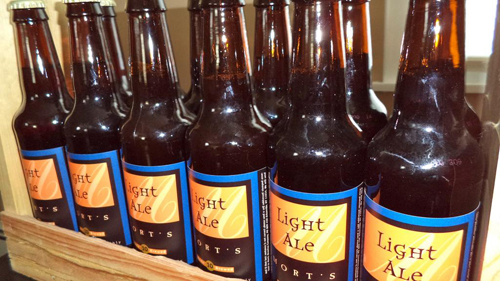 Dead Drunk’s fictitious brew, Mort’s Light Ale. RavMon: So how sober are you really when you play the Drunk? Do you ever take a nip of the bottle to stay in-character between takes? ML: Ironically, I don’t drink but if I did, I would get really groggy after one pint. RavMon: What draws you to horror as a genre? MP: I was introduced to horror films at a very young age. I remember watching The Shining and the original Friday the 13th on my grandparent’s television, back when we only had 13 channels. I remember being terrified by the original A Nightmare on Elm Street trailer. Those films petrified me, but, at 7 years old, I was fascinated by them. On top of that, I’ve always enjoyed Halloween season, so I could dress up like Dracula and the Wolfman. By the 1990s, my imagination became charged with enough inspiration to write original screenplays. And, because I also enjoy the comedy genre, everything I wrote was either dark, wacky or both. Michael Jackson’s Thriller video sparked my interest in zombies, as well as attracted me to the horror genre. ML: I’m a fan of great movies regardless of the genre. But what draws me to horror is the emotional roller coaster of fear, shock, jump scares that can be preceded or followed by laughter. And if the main character defeats the monster at the end, it can be a cathartic as well as a psychologically gratifying experience. RavMon: What are your favorite sober zombie movies? MP: Dawn of the Dead (original), Shaun of the Dead. . .The Walking Dead, but that’s television. ML: The first three George A. Romero zombie movies are the gold standard. Shaun of the Dead provided an excellent mix of comedy and drama as well. Even though it’s not a movie, The Walking Dead brings a grittiness and plausibility to the genre that cannot be ignored. RavMon: Do either of you have any microbrewer friends planning to give the rest of us a taste of Mort’s Light Ale? ML: That would be fantastic. Who knows? Maybe somewhere down the road it can be a possibility. MP: It’s possible. My friend Steve in North Carolina occasionally brews his own beer. He’d be my first choice to make that happen. RavMon: What does the future hold for the Dead Drunk? A bigger zombie apocalypse? Inebriated monster crossovers? AA? MP: I’ve been releasing the episodes bi-weekly, which will end by mid-October. After that, I plan to do some other projects, before returning to the Dead Drunk series; however, there may be a Christmas special this year. I’ve been tinkering with the idea of a “reboot” feature film version, which would have dialogue, but that’s way down the road. ML: Only Mike Polizzi knows the answer but I would love to be a part of a Dead Drunk feature length that is a “talkie”. We also have a bunch of ideas for merchandise. The possibilities really are endless. L-R: Erin Neu, Mike Polizzi, Mike Lane, Jay Priole, Monica Barber, and Harry Waldman. Thirsty, Savage Readers? Head over to http://deaddrunkseries.com/ and drink your fill.